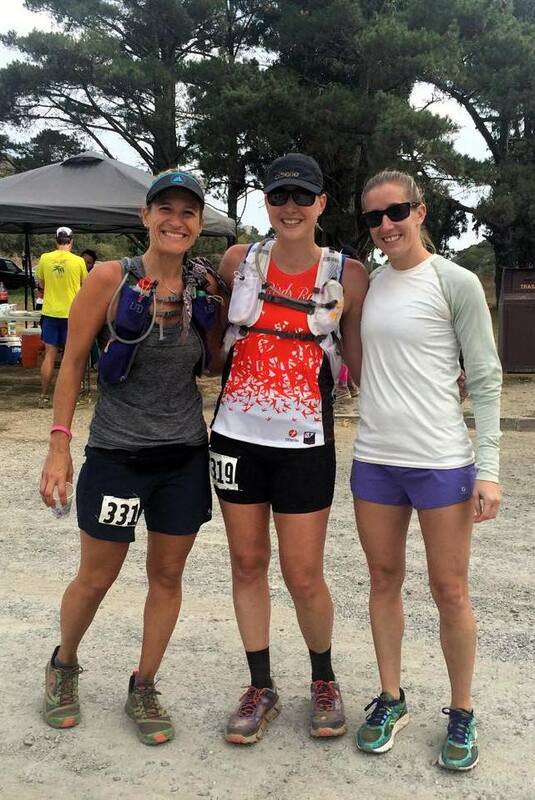 Two weekends ago I ran my first trail marathon, the Headlands Marathon in Marin. It was better than I ever could have imagined! Let's back up though. As part of 50K training, I wanted to run a trail marathon as my longest run. I'd only run road marathons before and felt this was something I needed to do for peace of mind. In the week or so leading up to the Headlands Marathon, however, I felt awful. Work was rough, I was unusually stressed and exhausted, and it was HOT outside so every run went pretty poorly. I started to think I wasn't ready and was quickly heading down a path of mental destruction. I knew, and told myself over and over, that I had to turn around the mental game before the race. I never did manage to get into the mental state I wanted before the race, and I even had thoughts of a DNS when I woke up race on morning. Luckily Kevin was there to make me go and to support me at the start line. The Headlands Marathon was (the shortest) part of the Headlands Endurance Run, and many people were running 50, 75 or 100 miles that day. I tried to use this as motivation too; if people could run 2, 3 and 4 loops I could surely handle one loop! At the start area I ran into quite a few people I know in the running community. Friends Matt and Kristin were running their first 100 miler that day and I enjoyed talking to them pre-race. They gave me great advice about how to think of the course: climb about 800-1000 feet, run downhill, visit aid station, repeat. It was very true and it really helped me break the course down in my head, calming my nerves a ton. Soon it was time for the 50, 75, and 100 mile runners to start at 7 am and I cheered them on. The marathon started 5 minutes later because we were doing an out and back to add to the 25 mile loop that would put us at 26.2 miles. Start of the 50, 75, and 100 mile. Matt and Kristin heading out. Next it was time for the marathon start. Almost as soon as we started running, my mind felt at ease and my body felt great. Perhaps it was the cool and foggy weather, or maybe it was how much I love running in the Headlands, I'm not sure. I enjoyed the out and back mile to warm up before the first climb on Coastal Trail, and I had some fun conversations with a couple of other runners on the way up. At the top of the first climb I started to get excited about the descent down Old Springs Trail into Tennessee Valley. I love that trail and I also knew Bay Birds team manager, Jenny, was working that aid station for the morning so I was excited to see her. When passing a couple of people who commented I was a speed-demon (not really, but nice thought) I told them I had to run faster then because that was my favorite trail. This would become a common theme throughout the race. 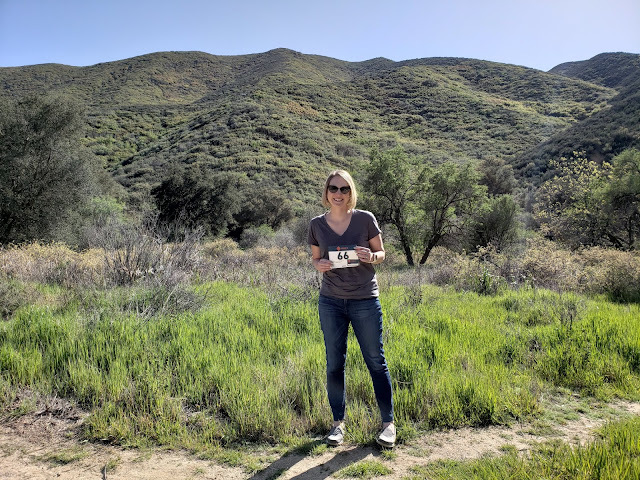 I arrived at the Tennessee Valley aid station, said hello to Jenny, and grabbed some Clif Shot Bloks. I wasn't there very long before heading up the road toward the Pirates Cove climb. At the start of that next climb, I found Pam from Oiselle Volée and her friend and chatted with them. I love the views from the top of that climb and told them that this was my favorite part of the course (favorite #2?) The views were great and this part of the course was pretty clear of fog so we could enjoy it. Before I knew it we were descending down to Muir Beach on an out and back section of the course; it was awesome to interact with everyone going the opposite way. Everyone was so encouraging. At Muir Beach, I found a few people I knew who had started with the first group; seeing familiar faces during a race is so wonderful. Matt and Kristin were there but headed out a bit before I did. I had some ginger ale (yum) and water, then went on my merry way. The climb out of Muir Beach was my biggest unknown and cause for concern. It's pretty long, has many false summits, and was the only climb on the course I had never done before in its entirety. I could see Matt and Kristin a little ahead of me and made it my goal to catch up to them (they were going 4 times as far so they would be taking it a little slower.) I finally caught up to them at one point and had fun talking to them while we continued to the top, then I separated from them when we started downhill. The route followed Miwok back to the Tennessee Valley aid station, where I made a restroom stop and grabbed Clif Shot Bloks and Coke. I discovered how much I like Coke during races, so I anticipate I'll be using it going forward. A little caffeine, a little sugar...BOOM. Perfect. At this point, I also ran into Pam and Erin and we took a quick photo. I was chewing shot bloks so my face looks funny. Next up, the Marincello climb. Earlier this year I was afraid of this one, but I've done it enough that I'm now totally fine with it and know what to expect. I climbed Marincello in January 2014 when my hip flexor was at its worst, and I associated it with major pain for a long time after that. This time I was excited because I knew that after that climb we'd arrive at the trees, my favorite part of the trail (#3.) When I arrived, the trees were wet and I thought it was raining, but in reality we were going back into heavy fog as we headed toward the Golden Gate Bridge. As we were exiting the trees I told the girl near me that she should look forward to the next part, SCA Trail, which was my favorite (#4.) I love running on SCA; it's almost like a ridge line in parts and it has views of the bridge when it's not foggy. There were no bridge views this day, but that's ok. As we neared the trail split where we'd go down to the bridge aid station, the wind became crazy. I have recently experienced the Hood to Coast storm and the wind at NYCM last year, and this was even stronger as it blew across the ridge. I literally grabbed onto the fence for support and it was hard to avoid not blowing into the people coming the other way. Once we turned downhill the wind was blocked and we could enjoy the single-track to the Conzelman parking lot, yet another favorite (#5) part I'd been looking forward to. We actually had to turn right at the trail head to go down under the bridge on pavement (then come back up) and I can't say I loved that part. Pavement, ick. All in all it was only about 1.5 miles or so and it was fine. The Golden Gate aid station was around mile 19.5, and I was doing much better than I expected. I texted Kevin to let him know I was ahead of schedule and to go to the finish. The climb back up to meet SCA trail felt a little slower than I hoped, but overall I was feeling awesome. 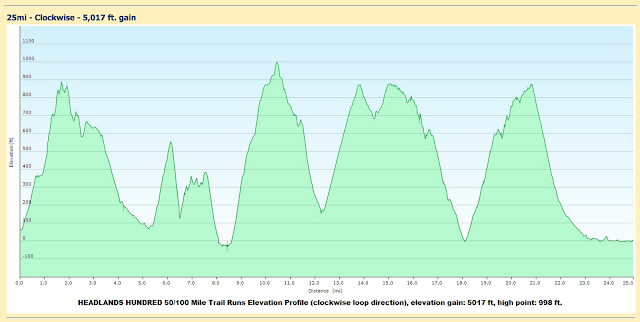 I survived the crazy wind again and then began the descent down Bobcat Trail toward the finish. Here I met Maili, another Oiselle Volée runner, and enjoyed talking to her for a few miles. The next thing I knew I was back at Rodeo Beach and the finish was close. My parents were in town visiting and my Dad was there to high five me as I came in - I loved having them there! I finished in 5:43:01 and I'm incredibly happy with that finish time. My expectation going into the race was to finish around 6:15, and the 'earliest possible' aid station estimates I gave to Kevin were for a finish time of 6 hours. You can say I was pretty shocked when I finished about 30 minutes ahead of my expectation. My first trail marathon finish line. All in all, this race went very well and it was one of those perfect running days. I had a blast and felt awesome for the whole race; even afterwards I didn't feel like I had run a marathon and my recovery time was similar to a regular weekend long run. I'm thrilled with this outcome, and I can only hope I have such a great experience at the 50K in October. Last but not least, I must say I was pleased with the execution of the race from PCTR. Trails were well marked, aid stations were great and even had porta potties, and everyone was very friendly. We received awesome hoodies and a cooler tote bag as the race swag. Thanks to them for putting on a great event! You are officially my hero. The elevation chart on that course made my heart skip a beat. I can't even imagine 26 miles of that! Congratulations on such a great race. You are a badass! Aw, thanks, haha. It's not as bad as it looks, I swear! Whoa that elevation is legit. Congrats on fighting through your mental stuff and getting it done! I love that picture of your dad giving you a high five. So cute! Woo hoo!! Congratulations on a great race, Paulette! I'm so glad you were able to see so many other Oiselle gals and have your family there for the event; that's fantastic. I share your affinity for ginger ale during trail runs/races; I'm pretty sure that's the only time it sounds good, so why is it SOOO good out there? There must be a secret ingredient that I don't know about. I know that you're going to do great at the 50K; I watched a friend finish her first one last year and it was so exciting!! Thanks! I'm pumped for the 50K! Wow what a great race! Finishing 30 minutes faster than anticipated AND having fun on the course AND not feeling worse for the wear afterwards - awesome!! Bring your positive attitude to the 50K and I think you'll do great!